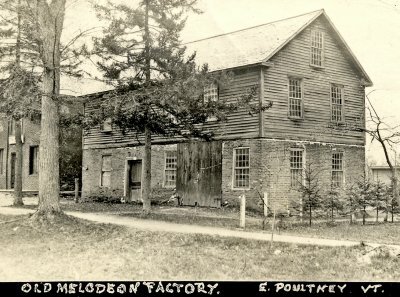 The Melodeon Factory is one of the last industrial buildings remaining from the earliest decades of the Town of Poultney, when what is now the East Poultney Green was the center of population and commercial and industrial activity. It was built about 1810 as a one-story blacksmith shop. 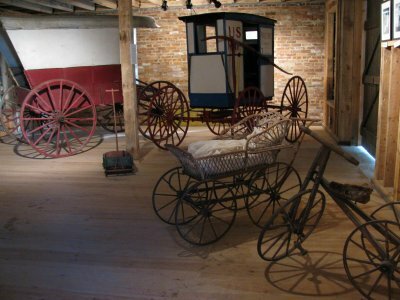 Here metal tools, wagon hardware, and mill equipment were forged and repaired, since a town on the frontier needed to be self-sufficient. The melodeon was becoming a popular instrument in the parlors of America – where music after dinner was one of the few entertainments. Foot pedals (treadles) worked suction bellows, drawing air inward through the reeds, thereby producing sound. Then in 1852 Joseph Morse and his son Joseph Harris Morse joined the firm, which changed its name to Ross, Morse & Co. With the business acumen of the younger Morse, the partnership flourished. A second floor was added to the factory — on the first floor the melodeons were assembled and tuned; the second floor was used for varnishing and polishing. J.H. 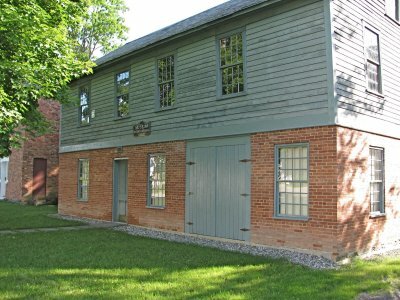 Morse expanded his mill at the river to build cases and other parts. Within four years this building became one of the most successful melodeon factories outside of Boston and New York. More men were added to the workforce and agents sold the melodeons as fast as they were produced. Now called Ross & Morse, the company had plans for immense expansion. But on one bitterly cold January morning in 1856, the water wheel supplying power to the mill at the river was found frozen solid to the surrounding rock. J. H. Morse and some helpers went into the wheel pit, first blocking the wheel so it wouldn’t move. Morse stood on one of the buckets chopping away ice as the others went inside the wheel to do the same. As the ice loosened, the weight of the water and ice in the buckets caused the blocking to give way and the wheel to turn. Morse fell and was crushed between the wheel and the rock, killing the 37 year-old partner. With the loss of J. H. Morse’s entrepreneurial vision, the hopes for the company’s expansion collapsed. Business began to dwindle. The elderly surviving partners continued production until 1864, selling off existing stock and laying off workers as soon as possible. 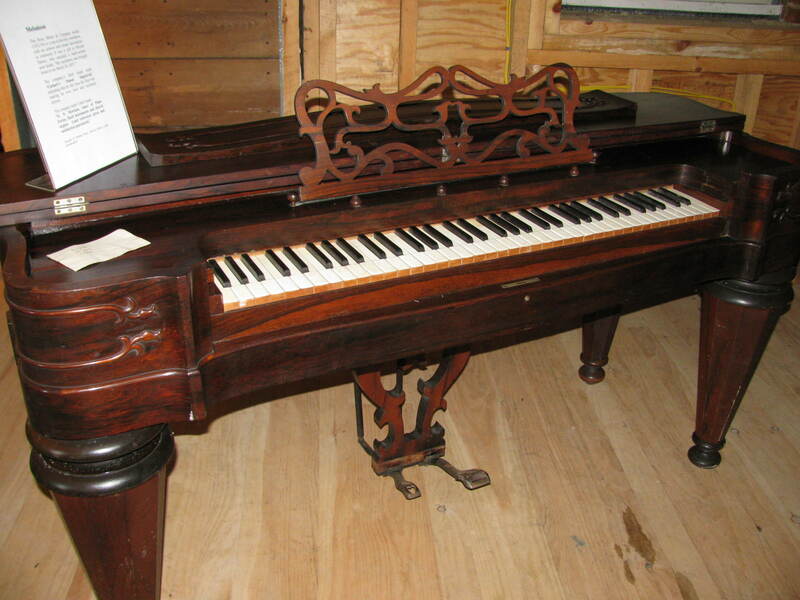 Melodeons continued to be manufactured under various partnerships until 1875 when the factory was finally closed. Since 1954 the Poultney Historical Society has maintained the Melodeon Factory as a museum and it houses several of the Society’s permanent exhibits. The building underwent extensive renovation in 2008. The second floor was temporarily raised several inches, allowing many of the disintegrating first floor bricks to be replaced. The masons worked to match the colors of the original bricks, and those old bricks can now be seen in the interior walls. To read more about the Melodeon Factory Restoration, click here.